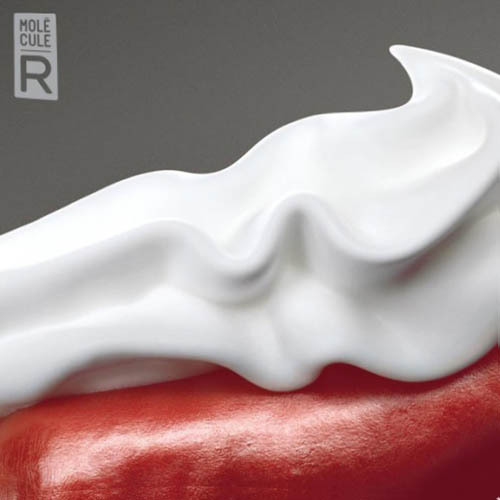 We have always promoted the creative use of cream chargers and now Molecule-r have packaged together all of the things you need to create molecular recipes with a cream whipper. 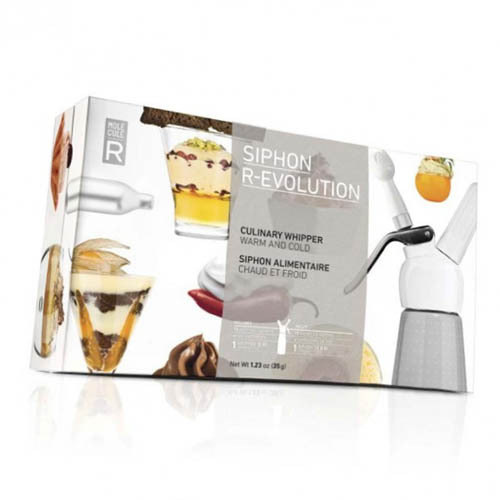 The Siphon R-Evolution Whipper Kit contains a whipper, NO2 refills, molecular ingredients and a recipe book. 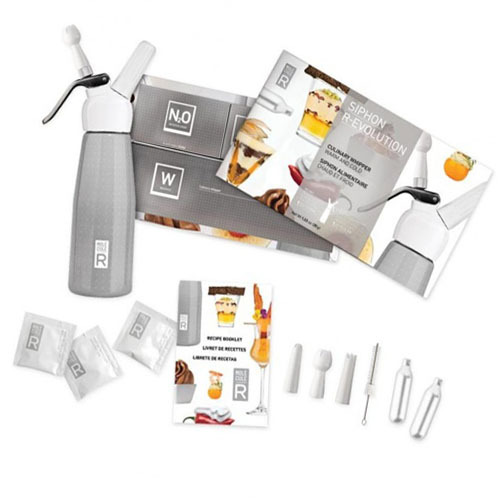 As with everything sold by the Molecule-r brand the Siphon Kit is beautifully packaged and easy to use. The step by step instructions make it easy for anyone to create some interesting dishes. Agar Agar: a thickening agent (hydrocolloid) that - unlike gelatin - works at higher temperatures. You can use this to create warm mousses and espuma (foams) from just about any liquid, although the higher the acidity of the liquid the higher the concentration of Agar required. As a general rule of thumb, use 1% Agar Agar by weight for creating foams. The agar is a thickening agent and its use in creating foams is due to the fact that after the liquid has been thickening (by dispersing and heating agar into it) then it has the ability to hold the nitrous gas that is introduced by the whipper. Xanthan Gum: Xanthan is derived from microbes and unlike the other hydrocolloids in the Whipper Kit it will not form a gel. Xanthan Gum thickens liquids when hydrated but does not form crosslinks so will not form a stable gel, this means that when used to crate foams they are light and airy (or can be denser when combined with agar or gelatine). Xanthan gum does not need to be heated in order to be used, but does need mechanical dispersion (with a hand bender) and time to hydrate. Cold Soluble Gelatin: You probably familiar with gelatin, even if you just know it in the form of Jelly at children’s birthday parties. 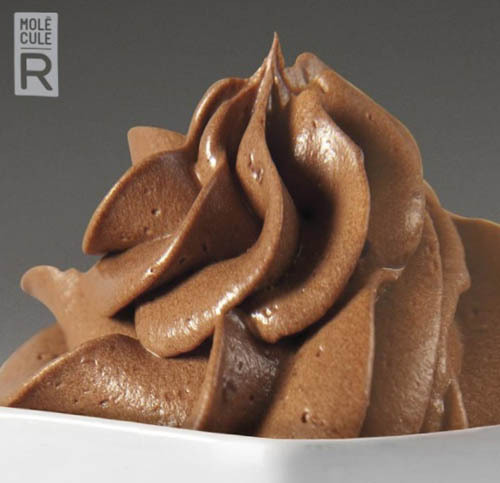 The limit on gelatin as a hydrocolloid is that it melts at quite a low temperature (26 degrees Celsius) this is also an advantage because it means that foams prepared with cold soluble gelatin will melt in your mouth in much the same way that chocolate does. 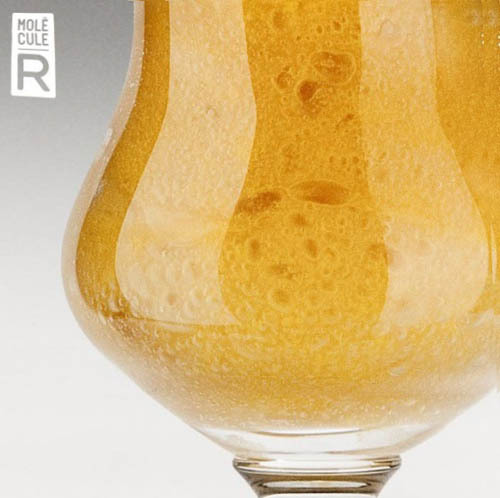 The Molecule-r Siphon R-evolution kit includes a book of 10 recipes, but here are three more for you to try – one for each of the molecular gastronomy additives. This is a pretty simple way to add a twist to your Sunday lunch, simply create the gravy exactly how you normally would measure it and then add about 50% double cream and 1% Agar Agar. Return it to the heat an use an immersion blender as it heats, simmer gently for a few minutes. Let it cool. Pour into the whipper and charge with a single N2O canister. This can be dispensed directly onto the hot roast dinner because the agar makes the resulting foam more stable at higher temperatures so it should hold its bubbles even on your hot potatoes. Or how about a foaming hollandaise, camembert dip. Xanthan creates a looser form than the other two molecular ingredients so is suited to the use on something a bit more fragile, such as a salad. Xantham is also not too sensitive to acids so will hold up the foam even when vinegar is one of the ingredients. To make the foaming dressing, start by making your favourite dressing (without the oil) add an egg yolk and blend, then strain. Slowly pour in the oil as you continue to blend. Then slowly sprinkle xantham powder (0.75%) over the surface of the dressing whilst blending. Pour into the whipper, charge with gas and give it a really good shake. This will keep for a week in the fridge until needed, then just dispense directly onto the salad. This needs to be done using real coffee (espresso) so don’t even think of trying it with instant. Like with any foam it will keep inside the whipper for quite a while once primed with cream chargers due to the anti-bacterial properties of the N2O gas. For the coffee cream foam, very simply – combine the coffee (double espresso) cream (approx. one cup) and sugar (to taste) then gently heat whilst adding the gelatine (0.5%). Add the mixture to the syphon, use a single cream charger, shake well and refrigerate. The colder it is the thicker and better. Shake once more before charging – the cream will have formed a jelly inside the dispenser so it helps if you can break it up. This is great on ice cream, cakes or anywhere you might use cream. Remember the foam will not be stable to warmth (above 26 Celsius) so it can’t be used on hot chocolate. Find out more at the manufacturers website. More ideas and recipes can be found at Modernist Cooking Made Easy. Using similar techniques you can also try some recipes that use lecithin with the syphon kit.